HOMEJiu JitsuAdd Jiu-Jitsu to Your Kid’s Back to School Routine! Add Jiu-Jitsu to Your Kid’s Back to School Routine! Are your kids back to school? Back to the routine? Find out how adding Jiu-Jitsu after school can benefit your child! Today we will talk a little bit about how sports, especially Jiu-jitsu can help your kids on their daily routine and why regular sports practice is the reason of school development improvement. An Archives of Pediatrics & Adolescent Medicine study screened 12,000 6 to 18-year-old children and concluded that physical activity contributes to cognition, increasing the blood supply and oxygen to the brain, decreasing stress and improving concentration and humor. Children access internet a lot more nowadays and the fast information available can be as good or as bad. We must be very careful with the use of technology for the youth. We, American Top Team FTL, are sport educators and we know how important it is to have a good school development. So school and Jiu-jitsu can make your child a more complete human being. 1. Less sitting, more physical activity. Nowadays most of the children are 7 hours a day at school and many parents end up signing them in an after school program because there is no other option, children get stressed and get tired sitting down for many hours. So we can say that 1-hour sport practice in the afternoon would benefit physically the children’s muscles and help prevent some injuries. Jiu-jitsu is a complete sport that moves all muscles of the body. 2. How to be a good winner, and a good loser. The behavior part will help children develop the competitive instinct they own, as Jiu-Jitsu is an individual sport. They will learn how to win and how to lose. We must teach children how to deal with the loss and how to learn from it. And start all over again to accomplish the goal and win. Jiu-jitsu teaches this every single day. To become a victorious human being. This will also help them understand that a bad test today can motivate them to study more and do a better test tomorrow. 3. Social skills and self-confidence are learned through Jiu-Jitsu. American Top Team Ft Lauderdale as a family gym worries about your child’s education, Master Junior Fernandes and his wife have two children and agree how Jiu-jitsu has played an important role on their education. For example, Ana Luiza Fernandes has been a shy child since she was little and she felt it hard to go to school. She used to cry a lot and she did not like school as she found it hard to make new friends. After 4 years of Jiu-jitsu training, she feels more secured, communicative, loves going to school and joining clubs and projects. On the other hand, Jorge Fernandes “Jorjao” has always been a secure boy with high self-esteem. Since he was little, he went to day care and he had some behavior issues and even “bullying” other children. Jorge started practicing Jiu-jitsu at the age of 4 and he has been learning how to love others every day and that you can train with your opponent and respect him. But Jorge was diagnosed with DDI (Dissociative identity disorder) and he was prescribed medication to calm him down and for that reason they decided to enroll him in Jiu-Jitsu classes earlier than Ana Luiza. Although his aggressiveness was making his parents worried, the Jiu-Jitsu training started to make a difference at his school’s results and he became a new child as he was using his energy in sports and it was a scape valve. Thanks to the routine, he learned there is a time for everything. This is one of the examples of how Jiu-jitsu helps various personalities. Today Jorge does not take any medication and he is in an advanced class at school, collecting many medals at home. 4. Teammates become friends for life. Although Jiu-jitsu is an individual sport, it cannot be practiced without an opponent. 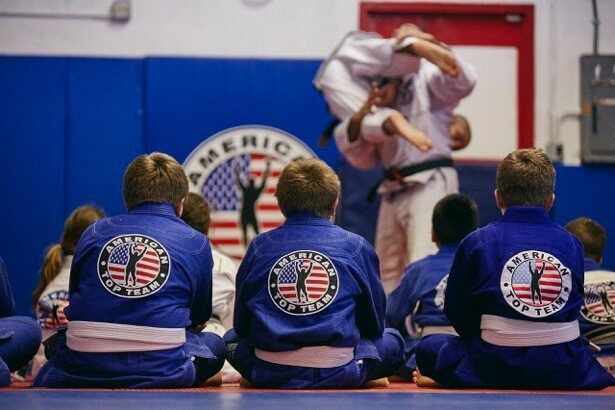 At American Top Team Fort Lauderdale students are taught the importance of team work. Teaching a position to a friend will make you grow. That will be your best training. This is a contact sport and the constant training will create a bond between them for the rest of their lives. 5. Discipline and respect are fundamentals of Jiu-Jitsu. Let’s talk about the discipline of Sports that will be used in the classroom. As everything in life, habit and routine, children learn on TATAMI that they must respect their SESEi master and after some months they understand that this should be the same type of respect they have for their school teacher, who studied for years to teach them and prepare them for their future. Master Junior Fernandes always talks about the importance of school to each one of them. Discipline is taught from the uniform to be wore to the respect for their training friends. We hope some of the above information can explain the reason we believe Jiu-jitsu can help your child a lot at school. So train for a week with us to understand it. For more information, call (954) 638-0860 or email anaattftl@gmail.com.